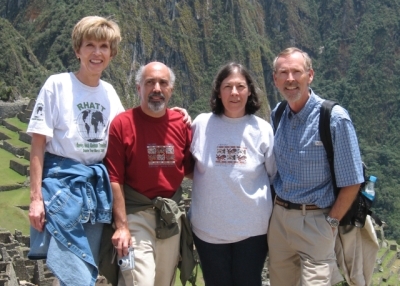 Prologue: Our trip to Peru was the first RHATT adventure into South America. 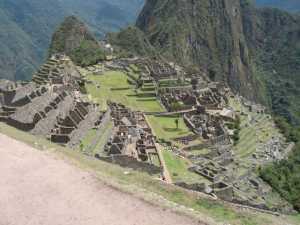 The major attraction was to visit Macchu Pichu before it become overwhelmed with tourist. Robin and Steve began the research for the trip almost as soon as we return from China. We met in Houston in February to finalize the plans and make the reservations. We had to choose our travel dates around Becky’s and Steve’s travel schedule…fortunately we found the first week of October open and the deal was sealed. 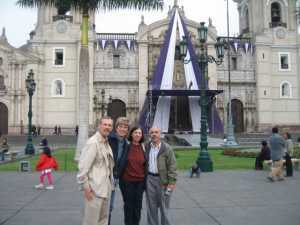 This was our departure day for Lima; Robin and Steve left Newark in the morning, Hugh and Becky joined the journey in Houston’s Intercontinental airport. We met in the Continental Airlines President Club and shared a bon voyage toast to another great RHATT adventure. Our flight was on time with the usual excellent service. The flight duration was close to seven hours to cover the 3133 mile distance. We arrived in Lima a few minutes past 10:00pm, cleared immigration and customs, collected our luggage and then found our smiling driver waiting to take us to the El Condado Hotel. The ride to the hotel in Miraflores was about 35 minutes; the driver would direct our attention to points of interest as we passed through the city of 9 million inhabitants. We checked into the hotel and after the traditional nightcap of single malt and chocolate we turned in for the night. The breakfast buffet in the El Condado was sufficient, but not opulent. But fortified with Peruvian coffee we were ready to explore Miraflores. We wanted to get our boarding passes for the LAN flight on Saturday to Iquitos…but the hotel computers could not bring in the website so we decided to wait until we could pick them up at the airport. Next we visited the Indian Market for our first of many opportunities to purchase Alpaca articles. Becky tried on many sweaters and eventually bought one with the promise to continue looking for the perfect one. Hugh found an Alpaca blanket that will probably find a home at the lake house. After touring the Indian market we visited a local grocery store for snacks and bottled water. Our three-hour city tour began at 2:30pm. We started at the archeological ruin named Huaca Pucllana or Juliana Located in the district of Miraflores, located at General Borgoño Street. A ceremonial center dating from earliest stages of the Lima culture. Huaca with a pyramidal shape, pre-Inca adoration site dedicated to the God Pachacámac. which was an ancient site of religious ceremonies and sacrifice. From there we continued on to the San Isidro district and the area of the Olive Park and homes of diplomats and wealthy citizens. 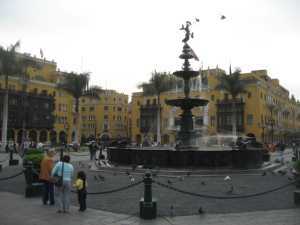 We slowly made our way to the central main plaza of downtown Lima…traffic congestion has chocked the city. We stopped a museum that in its former life was a bank, but the basement had been converted into exhibition of the history of the civilizations that have existed in Peru. The old bank vault was a display of antique gold jewelry and ceremonial pieces. 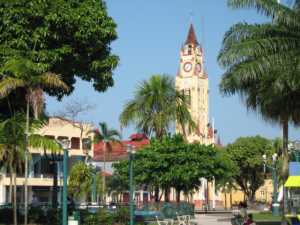 We walked to the main plaza which is ringed by the cathedral, the bishop’s palace, the presidential palace, city hall and other government building. We continued on to the monastery of St. Francis of Assisi for a look at the library, art, architecture and catacombs. By now we had seen the major sites in Lima and were ready to return…unfortunately it was rush hour on Friday afternoon so the trip back to the hotel required almost an hour. Back at the hotel we met in the bar for our first taste of the national drink…the Pisco Sour. It’s very similar to a tequila sour…my opinion was that it was too sweet to be a refreshing sour. The bar was attached to the restaurant where we dined on grilled Chilean sea bass paired with a lovely Casillero del Diablo Sauvignon Blanc. Our focus after dinner was too get to bed as soon as possible because the next morning wake up call was at 3:00am. When we originally booked our flight from Lima to Iquitos, we chose a departure time around 7:30, but LAN rescheduled the flight for 5:20am. Fortunately the transport was on time and the traffic had abated for the night. The flight was on time and unremarkable…approaching Iquitos we got our first glimpse of the rain forest and the Amazon River. The temperature in Lima when we departed was in the mid 50’s…when we landed in Iquitos we stepped out to 95 degrees and high humidity…not much different from a July day in Houston. The weather never changes in the city of 500,000 which is only 3 degrees (30 nautical miles) south of the equator. The average rainfall is 150 inches a year and there is rain about 250 days a year. In Iquitos we boarded the Amazon Queen for the 28 mile (1 ½ Hour) cruise up the Amazon to the Explorama Lodges Ceiba Tops resort. Iquitos is a major port on the river where the Indians bring their goods to market and the trees from the rain forest are sent to the sawmill for the first rough cut. It is a bit uncomfortable to see the huge rafts of logs waiting to be made into furniture to decorate our homes. The water level of the Amazon varies about 45 feet over the course of a year. September is the ebb and we saw the river about 10 feet above the lowest point. As we arrived at the Ceiba Tops Resort, we were escorted to the bar and dining room for orientation and introductions. The accommodations are quite comfortable with air conditioning and running hot water and a well stocked mini bar. The first activity after unpacking was lunch at 12:30 that was a pleasant chicken and pineapple dish served with rice and vegetables. Our afternoon adventures began at 2:30…we were going piranha fishing and dolphin sighting. 18 guest of the Ceiba Tops Lodge boarded a 20 foot open boat with a 40 horse outboard motor…our first stop was a small tributary about 20 away from our dock. The lodge provided each guest with a 4 to 5 foot long pole with about 8 feet of monofilament line, a sinker and a hook and a piece of beef stew meat for bait. We learned that there are 23 species of piranha in the Amazon on 7 of which are carnivores…the rest are vegetarian. We baited our hooks and dropped the lines over the side…we didn’t have to wait long before the piranha began tearing into the stew meat. Hugh caught one of the two that were boated by our group…they are a small silver colored and perch shaped fish with teeth and fight much like a bream. Unfortunately the hooks were neither sharp enough nor sized correctly so most of the group only got the experience of feeling the bite without boating the fish. After a half hour of fishing, we motored downstream to a small tributary to look for the pink Amazonian dolphin…we didn’t have to wait long before we saw the characteristic roll and blow, but much to our delight the dolphin was pink. Raoul, our guide, guessed that there were about 7 dolphins in this pod including females with their calves. A group of nomadic fisherman were camped on the bank and we stopped to look at their catch…unfortunately they had not been real lucky but were able to show us some of the variety they had caught…none resembled the fish we are familiar with from home. We proceeded back to our dock with plenty of time for a shower and happy hour before the 7:30 dinner. 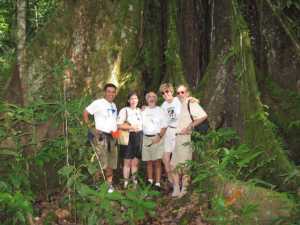 Another early morning call for our 5:30am departure for the Explorama Napo lodge which was 2 hours away by speed boat. We headed downstream for an hour on the Amazon until we reached the confluence with the Napo river where we turned upstream for another hour run until we came to the Napo Lodge. The sights along the river included many native settlements and agricultural activities…bananas and rice were the major crops we could identify from the boat. There is very little boat traffic on this stretch of the river except for the native Indians in their dugout canoes. Most of the canoes are paddled, but some had motors…I just don’t know where they could get gasoline for the motors. We arrived at the Napo lodge and immediately went to the dining room for breakfast; the Napo is one of the Explorama Lodges, but unlike the Ceiba tops, this is rustic without electricity, hot water or flush toilets. After breakfast we walked about 40 minutes into the jungle to the canopy walkway. We spotted some monkeys along the walk but not much else in the way of wildlife. 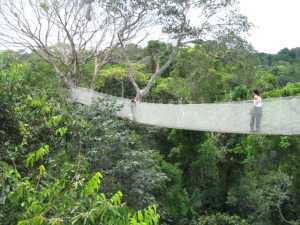 The canopy walk was begun in 1991 and is now over 700 meters long with 12 towers; it reaches a height of 120 feet above the forest floor. The walkway is a suspension bridge that is supported by steel cables and supported every three feet with natural fiber rope. We were limited to three persons on a single span of the walkway. The view and perspective of the rain forest is quite different from the tree tops…the bromeliads and orchids are prolific and colorful. The breeze is refreshing compared to the humidity trapped below. We had some nice vistas over the forest, but with the exception of a few birds, lizards and one tropical miniature squirrel…this was an experience primarily of the flora and not of the fauna. Our group continued on through the jungle to the medicinal botanical garden and a visit with a local medicine man or shaman. The trek through the Amazon rain forest was steamy, slick underfoot with hidden dangers (poisonous vipers) lurking under bush…Raoul with native ingenuity and cunning, stalked and slayed the venomous viper. After the jungle experience we had lunch in the lodge and then relaxed in the hammock house while entertained by the local birds and nutria (better known as big Charlie). The 2 hour boat ride back to Ceiba Tops seemed to pass quickly as we continued to be amazed by the vastness of the Amazon and the natives who rely on the river for their lifeline. We were ready to wash off the grime (sunscreen & insect repellant mixed with sweat) from the day and begin the ritual happy hour. Dinner in the lodge was a fresh water fish that was similar in taste and texture to tuna. This was our first chance to sleep in since leaving Houston…there was nothing scheduled before breakfast at 7:30; however Becky and Hugh decided to get a cup of coffee and explore the area around the Ceiba Tops Lodge. We got our first look at the swimming pool, the hammock house and the other accommodations that make up the lodge. We also spotted a deer faun which had been adopted by the kitchen staff. After breakfast, we met at the boat dock for our 8:30 departure to the Explorama Lodge which was about 35 minutes downriver by speed boat. We hiked about 10 minutes back to the lodge where Rauol gave a bit of history about the lodge. 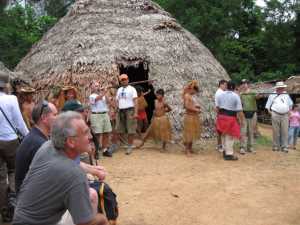 It had been located near the village of the Yagua Indians so that Peter Jensen (the Explorama founder) could live with and study their culture and help to preserve it. The size of the Yagua tribe has dwindled to about 60. They try to hold onto their tribal customs and dress but the outside world is quickly closing in and luring the young members away. Now they survive as a curiosity and entertainment for the tourists who purchase their crafts for souvenirs. They presented a program of tribal dances and a blowgun demonstration. We each had a chance to try hitting a target with the darts and most of us made a hit with only a couple of tries. There was a 2-month-old 3-toed sloth which was a hit of the tourist. After our visit with the Yaguas, we returned to the lodge for lunch followed by a fascinating hike through the primal rain forest. The sights were amazing highlighted with virgin Ceiba, Kapok, Mahogany and Maquira trees while monkey frolicked in the treetops. We emerged for the dense rain forest into a sugar cane field where we stopped to visit a 140 year old cane press (powered by three tourist in place of one horse) where they made molasses and local rum (25% alcohol…50 proof). We were invited to the owner’s cantina to taste his homemade rum. It is a crude distillation that requires an acquired taste to appreciate…we left it on the table. Following the rum tasting we motor upriver back to the Ceiba Tops where we discovered a family of saddleback tarmarin monkeys playing games and enjoying bananas supplied by the tourists. As dinner began, we experienced our first rainfall of the trip and it continued late into the night. While the rain was gently dancing on the thatched roof of the dining hall, we remained for a floorshow produced by the local talent. Teenagers from nearby Indiana community performed various traditional dances and a group of musicians with guitars, flutes and drums entertained us with Peruvian songs. The rain had stopped sometimes during the night and the morning air was fresh and cool. 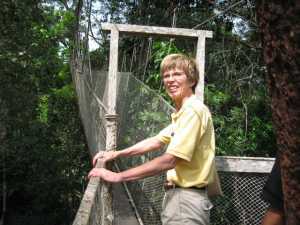 Our final Amazon experience was a visit to Monkey Island which is a three square mile reservation for monkeys. Most are rescued pets and government seizures from smugglers. All have been returned to the wild and are repopulating the park. 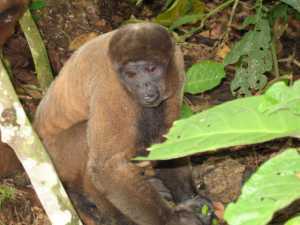 There are 23 varieties of monkeys on the island (all are native to the area) and the vast majority have colonized and returned to the rain forest. Several of the younger and newer arrivals remain around the central arrival area to greet and entertain the guests. They are very social animals and seem to enjoy the human contact, many jumped on the shoulders and into the arms of the tourist…some reached into the ladies handbags to steal anything they could. They loved to play and swing from the trees and were never far away from a banana hand out. We learned that outside of humans, the only predators of the monkeys are birds of prey and snakes. This rehabilitation project has been underway for nine years and is proving to be a huge success both commercially and environmentally to preserve the monkeys. We hiked back to our waiting water taxi for the return to the Ceiba Tops. 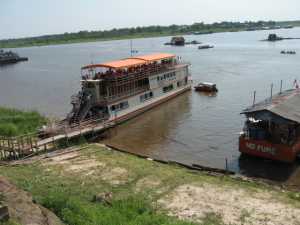 We enjoyed our last lunch at the resort, paid off the bar tab and returned to Iquitos on the Amazon Queen at 1:00. Iquitos is a bustling town of 500,000…it is not a tourist destination but it certainly is a curiosity to see the enterprise, the thousands of 3-wheel motorcycle taxi’s, and navigate the pot-holed filled paths that pass for roads. Our flight back to Lima was about 45 minutes late…our transport was waiting for us as we left the baggage claim area. We pause briefly to print our boarding passes for the flight to Cusco the next morning and then went to our accommodation for the evening. There was a Chili’s restaurant one block from the hotel which we chose for our venue for the remainder of the evening. Our flight to Cusco departed at 6:15am., so once again we had a before dawn checkout and transfer experience…our second of three for this trip. 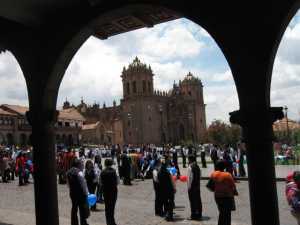 We were met in Cusco and transferred to the 5-star Libertador hotel where we had an hour to check in and enjoy the breakfast buffet before the 9:30 departure for the all day tour of the Sacred Valley. 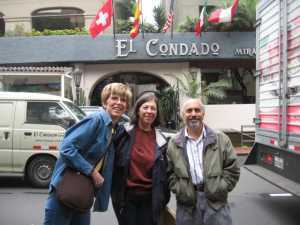 We met our driver, Edwin, and guide, Leo, and began to tour the area made famous by the Incas. Our first stop was at a llama exhibition where we learned about the 5 varieties of llamas that are found in Peru as well as the products and quality of each…the premium being products made from Vicuna wool. We made several stops to enjoy the mountain vistas of the snowcapped Andes over the verdant valley. We learned that the principal crops are potatoes and grains; there was some livestock mostly pigs and sheep, although we did see some cattle. None of the farming is mechanized; all of the plowing is done with oxen and the cultivation is done with hand tools. Along the entire route of the day, we saw examples of Inca terracing in the mountains; they served two purposes: 1) to provide additional plots for cultivation and 2) for landslide and erosion control. Our next visit was to the city of Pisac for a shopping experience in the local market. Here Mistisos offered all sorts of Alpaca products, folk art, jewelry and other handicrafts. We did our part to help the local economy, before continuing on to our lunch break. 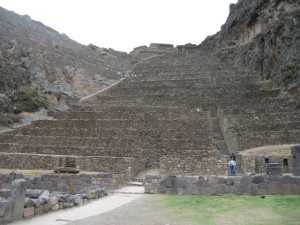 After lunch we continued on the site of the Inca ruins at Ollantaytambo…this is a mammoth temple and social complex that contains marvelous examples of the Inca ingenuity. Many of the houses in the area were constructed on centuries old foundation with only the above ground structure from the modern era. We continued our tour over the 13,000 foot high mountain pass to Chinchero another Inca monument consisting of terraced field which were once cultivated with potatoes and other products to sustain the population. We met Maria there, a young Mistiso girl who guided and entertained us during the tour. From Chinchero, we returned to the Liberdator in Cusco for a quick change and happy hour before we walked to the Plaza de las Armas for our evening reservations at the Inka Grill restaurant. This was a delightful venue with a menu full of traditional Peruvian selections. Following dinner we needed no encouragement to get to bed early because Thursday morning would bring the third of our pre dawn Peruvian departures. This is now becoming routine…up at 4:00am, down to breakfast and depart at 6:00am, but this time on the narrow gauge train from Cusco at elevation 11,000 feet down to Machu Picchu at elevation 7,000 feet. 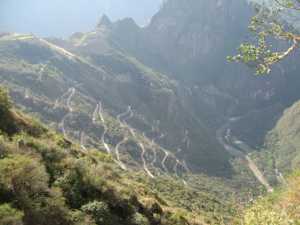 The train departed on time a t 6:00 and began its climb of three switchbacks out of Cusco on the 68-mile journey. The 3 hour 45 minute ride offered some beautiful vistas through the mountains and gorges. As we arrived in Aguas Calientes, we were greeted by our guide for the day, Armando; he took us to our hotel to check in and then we boarded the national park bus for the 30 minute ride over a series of switchbacks to the Machu Picchu Citadel. For the next 2 hours Armando filled us with the history and lifestyle of the Incas. The advancements and knowledge of their civilization is a marvel to discover. We were amazed at their ingenuity and creativity and craftsmanship. The sights and vistas defy verbal description and a 2 dimensional photograph cannot fully capture the awe of viewing this 500-year-old community. Armando led on a 2-hour tour of the community and invited us to try some of the echo niches and capture the metaphysical energy of the mountains. About 2000 tourists visit Machu Picchu each day, but Armando knew areas where he could give his information without distraction from the crowds. At 1:00 we took a break for the lunch buffet at the Sanctuary Lodge hotel; Armando gave us some suggestions for the afternoon as well as the remainder of our stay in Aguas Calientes. After lunch we returned to the pueblo and climbed 1000 feet up the Inca trail to the Sun Gate. During the winter solstice the sun rises through this notch in the mountains. The climb up to the Sun Gate required about 40 minutes and provided some marvelous views of Machu Picchu. We had agreed to meet Robin and Steve at 4:30 to watch the sunset; it was nice to be there as the crowds dwindled and tranquility returned to the park. As the afternoon haze enveloped the mountains, we realized that we had no chance to see a memorable sunset. We took a bus back to our hotel, stopping in the bar to start rehydrating our bodies after a day in the dry mountain air. There are plenty of restaurants in Aguas Calientes which offer a variety of menu selections although pizza seems to be the most popular item in the town. We selected a vegetarian pizza a bottle of Peru’s premium red wine…both were good. We had a relaxed schedule for our last day in Peru. We had planned to make this our day to tour Cusco and shop. After enjoying the bounteous breakfast buffet in the hotel, we starting visiting all of the recommended Alpaca shop in search of the perfect sweater. The selections were abundant and we had no trouble finding a sweater we liked…only deciding which one to choose. Much to our delight as we were visiting the shops which ringed the Plaza de Armas, a parade began to circle the square…it appeared to be many of the local trade schools; some in local dress others just marching behind their school banners. It was an interesting diversion, but after a short pause to view the parade we returned to our shopping and pursuit of lasting souvenirs. Becky and Hugh stopped to visit the Inka Museum while Robin and Steve continued to help the local economy. 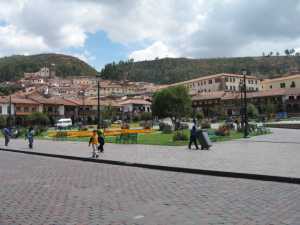 Soon the shopping was complete and we had to meet our driver for the return to the Cusco airport. We arrived back in Lima to wait 6 hours before our departure for Houston and Newark. Fortunately we had invitations to the 1 st Class Lounge that helped to make the wait more bearable. All in all a trip of planes, trains, buses, boats and ‘tuk tuks’.